What is a Lego Dimensions Starter Pack? - Join the Building Craze! What is a Lego Dimensions Starter Pack? The children are talking about Lego Dimensions and telling you that they want the game and they are asking you to get them the starter pack. Perhaps you are not a gamer yourself and you need a little help to make sure that you are getting the right thing. Let me help you by explaining what a Lego Dimensions starter pack is and the options available. I wrote a post a few days ago that explained what Lego Dimensions is and I recommend you read it if you are new to the game. The starter pack you buy will depend on the game platform that you will be using it with because these are machine specific. This is the only machine specific pack int he set. You will also need an active internet connection. This will be used for updates when you first use the game and for future updates when they are released. The price varies depending on the platform with the list price being either $79.99 or $89.99. The prices on Amazon are lower with the Xbox 360 version being $59.99 when I last checked. 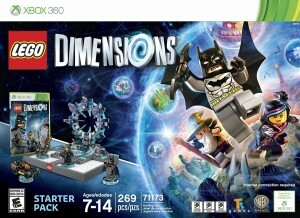 What is included in the Lego Dimensions starter pack? The set has 269 Lego pieces that are used to build the game portal, the mini-figures and the vehicle included. Wyldstyle from The Lego Movie. There is a 3-in-1 Batmobile that can be rebuilt into a BatBlaster or SonicBatray – each has its own unique in-game abilities. You also get Batman’s Batarang, Wyldstyle’s relic scanner and Gandalf’s staff. Lego Toy Tags for each of the included mini-figures and for the vehicle. These Toy Tags are used to place the characters on the Lego Toy Pad to bring them to life in the game. When you open the game set there are instructions for setting up the game and building the mini-figures Batman, Galdalf and Wyldstyle. In the game you will be given instructions to build the Lego Gateway or Portal and place it on the Lego Game Pad. Now you can really get going with the game. Having the 3 characters mentioned opens up the worlds of DC Comics, Lord of the Rings and The Lego Movie. As I have mentioned, you can play through the main story with just the starter pack. I am sure soon there will be requests for some level packs, team packs or fun packs. These all expand the game in some way and allow access to different characters, other vehicles, more puzzles, challenges and side quests when more Lego worlds are opened. Now that you know what the Lego Dimensions Starter Pack is, just remember to make sure that you choose the one for the correct game platform that it will be used with. This is a great game and will definitely provide many hours of entertainment, both as a video game and also just having fun with the models of the characters and the vehicles. If you have any questions or feedback of your own, please leave a comment below. I love lego, my husband loves lego and my kids love lego. One of the reasons we love it is that when we play lego we play together, we bulid stuff together, our kids imaginations come to life. They create, and build and destroy and build again all fueled by their glorious imaginations. When they play lego, they don’t need tv or video games or phones or any other technology. I can’t understand why lego would ever come up with a concept that would join their building bricks with a product that brings the child (or adult) away from the physical element of play to be sat in front of a computer screen. That is just what makes Lego Dimensions different. Throughout the game they have to stop and build, or rebuild, something that they need in the game. Unlike other video games, they have to have the physical Lego pieces to be able to use them in the game. They cannot play with characters that they don’t actually have and they have to rebuild vehicles as directed in the game. I am sure the kids will eventually play the game through and then use ideas from the game to play with their Lego blocks again.